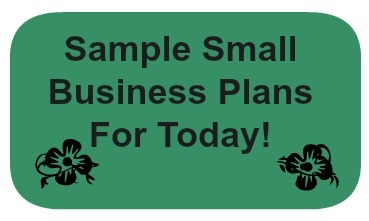 Here are two sample small business plans that are a couple of my standard plans. I personally find them to be very useful for my planning purposes. I'm sharing these with you in hopes that you'll find these plans as useful as I do. 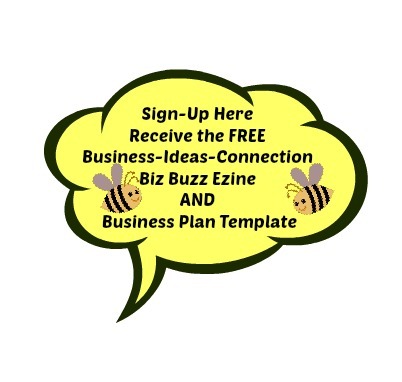 These plans are for small and/or home based businesses who require a more simplified one-page version of a business plan. I have found these to be universal to fit many business ideas. Note these plans are not meant to be a one-size fits all if your company will be a larger corporation or you'll be requesting funding in the form of loans from banks or investors -- these types of businesses require a more in-depth plan. These plans will get you started with your planning cycle. Of course, the point of planning is to be able to put your plans into Action. But first, you need to know what action steps are important to your business. 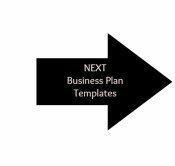 The first plan is my standard one-page business plan where I do the majority of my planning at the kitchen table or out on the deck (weather permitting!). I sit with my plan and think about what it is I want to accomplish in my business, what external elements are impacting the business, and how I want to approach each aspect of the business. While the planning process may appear to be a bit daunting -- just approach it "one bite at a time". 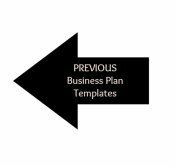 This sample small business plan template will walk you through the major sections one step at a time. Work on each small section at a time -- you'll find it goes rather quickly! For example, this year when I was planning my business . . . I grabbed a cool drink, my plan template, a couple of pens (because I like "color"), and within about 3 hours I'd covered the whole plan. Ready to identify action steps for my calendar! What Fun! Because once you've actually worked through this process and thought through all of the questions to put your plan together, I guarantee you'll be excited and enthusiastic about your plan, the coming year (quarter, month?) and the process! This can be another terrific way to verify this is a good business for YOU! If you're not excited about the business when you've finished, you either haven't completed the full planning process OR your idea may not be a good "fit" for you! I've provided a full step-by-step approach to each section on the following pages to give you some idea of how I use this particular template. You can find the full discussion here . . . Step 1 -- Success Is . . . Step 4 -- Getting the Word Out! This particular plan allows me the freedom to "see" my thoughts and ideas on paper. I personally am a very "visual" person and ideas/thoughts on paper spring to life in front of me. It energizes me to put ideas together in a "visual" representation using color to make the ideas come to life! 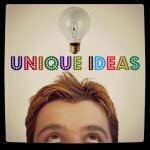 Take this plan and make it your own -- it's a very productive and fun plan to develop. For additional ways to use the plan -- click here. 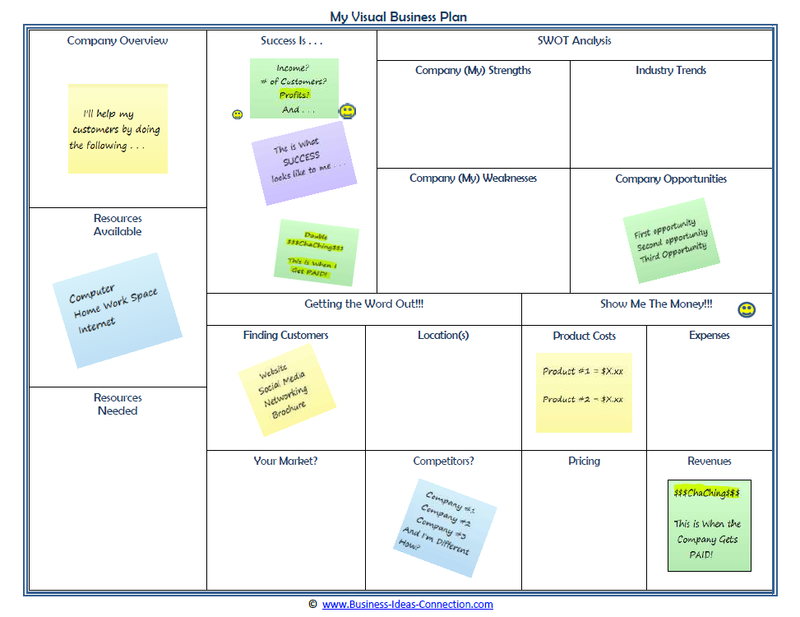 And here is the discussion on how I use my visual plan template. Use both of these tools to get you started on the right track. Once you've got a solid plan, determine what your next steps are to get started. Document the next steps . . . 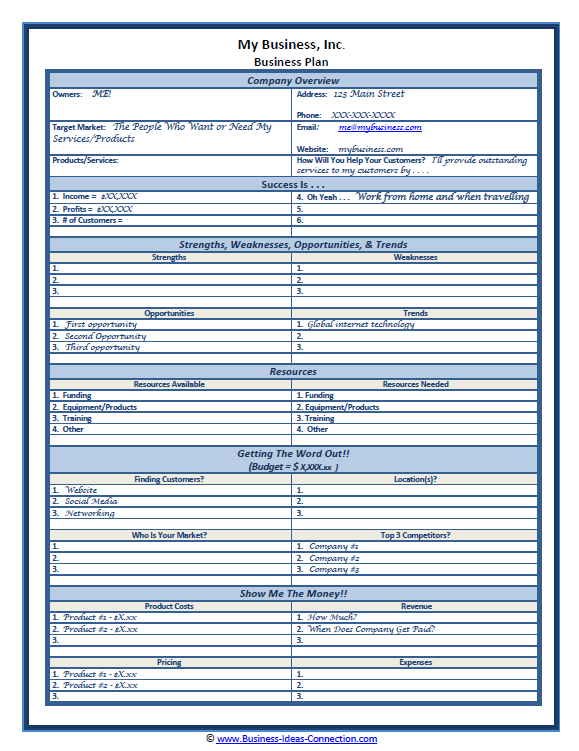 Sample Small Business Plan Template to Business Plan Templates . . .